Members of the Freedom Food Alliance at Growing Powers’ conference 2009, in Milwaukee, Wisconsin. Victory Bus Project – The Alliance uses the VROOM bus cooperative for some of our projects; food distributions, trips to the farm and now prison trips. 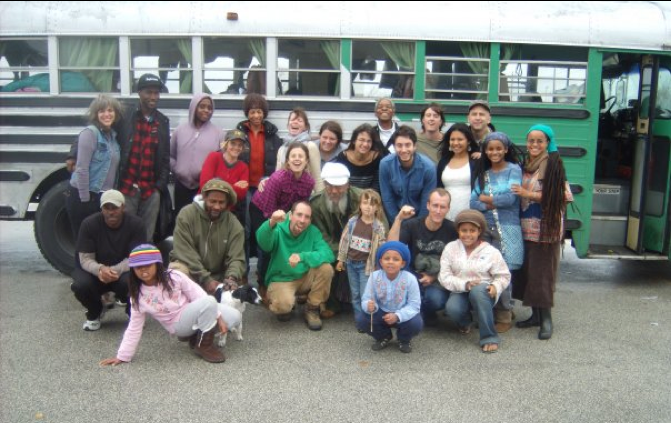 Our prison trips are called the Victory Bus Rides after Herman Bell’s Victory Garden’s project. The goal is to make it accessible for families in urban communities to visit their love one’s in rural prisons, offer them CSA share and also engage them on the prison industrial complex and food sovereignty. Pushing folks to demand more small farms in rural communities than prisons. Farm Education – Soul Fire Farm is the model for Farm Education which involves reconnecting youth to their innate belonging to land and restoring each person’s rightful place of empowerment in the food system. Training – Soul Fire’s Black and Latino Farmers immersion program is designed for novice growers to gain basic skills in hand-scale farming and whole foods preparation in a culturally relevant and supportive environment. Restorative Justice – Soul Fire Farm and Friends of Brook Park restorative justice efforts involves reconnecting youth to land and building initiatives and practices where young people can work on farms to pay off their restitution, instead of being incarcerated. Grassroot Organizing / Advocacy – Milk Not Jails Policy Agenda, formed after conversations and correspondence with thousands of criminal justice advocates, farmers, prison families, formerly incarcerated people and rural residents, creating a package of policy changes that can transition upstate New York away from its reliance prisons to a vibrant small farm economy.